The vigorous campaign for the presidential vision of PDP presidential candidate, Alh. 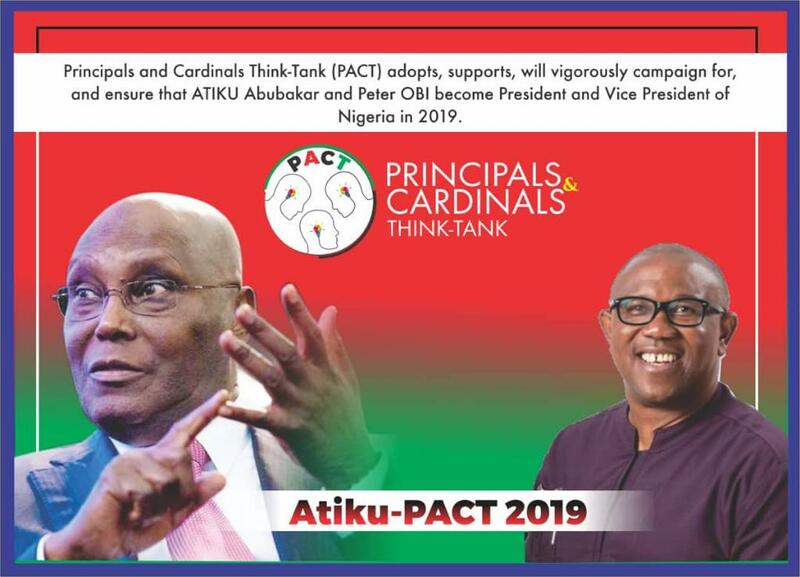 Atiku ABUBAKAR and Peter Obi, his running mate, may have entered a new dimension of creative and innovative mobilization for supports, as the "Principals and Cardinals Think-Tank (PACT)" introduces new strategies to promote the presidential candidature of Atiku/Obi in the 2019 polls. The Principals and Cardinals Think-Tank (PACT) is an unusual support group, with creative strategies and a reservoir of ideas to promote the political visions of Alh. Atiku Abubakar in the forthcoming presidential election in 2019. According to the National Prefect of PACT, Mr Timothy Ademola, the forum has commenced a supportive and vigorous campaign to ensure that the PDP candidate comes out victorious at the 2019 presidential polls. He stressed that the forum is dedicated to a massive mobilization of Nigerians through it's innovative and carefully thought-out strategies to sustain the unequivocal mandate of Atiku/Obi. While reviewing the campaign approach of Principals and Cardinals Think-Tank - PACT, our reporters observed the growing impacts of a new online videographic content created and published by the forum, that is already attracting massive reactions and support from the entire Nigeria people because of its unique content. This responsive online content titled "Uncle La La", highlighted the complains of Nigerians across all sectors/national grid who are fed-up with the ongoing situations in the country, and are in dying need for a new leadership that can leverage them from the present challenges of hardship and hopeless struggles. In their optimistic quest for a new government, they poured out their complains of unemployment, increase in the cost of food, inability to afford school fees for children, killings and insecurity to "Uncle La La", who provided them with a solution of coming together to collectively build a synergy to vote for the PDP Candidate, Alh. Atiku Abubakar, stating that he is the only one that can take Nigeria to the promise land. The online advert documentary of "Uncle Lala", is already setting a new agenda for youths, children, public service holders, local support groups and enterpreneurs who are active participant in deciding the future of Nigeria in forthcoming polls. 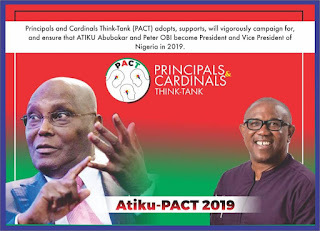 The Principals and Cardinals Think-Tank support group for Atiku/Obi is a stronghold in the presidential campaign of the duo, structured to deliver the presidential candidate of the People's Democratic Party in the 2019 February polls.